The profiles produced by the DISC profiling system have a very wide range of uses. Recruitment is undoubtedly the main area of application at present, but profiling techniques present possibilities going far beyond this. This chapter looks at some of the application areas where the DISC system can be most effective. Important: No decision affecting a person's career should be taken solely on the basis of a behavioural assessment. There will always be other factors outside the abilities of a behavioural instrument such as skills, training or experience that must be taken into account before reaching a final decision. The main use of commercial profiling is as an aid to the selection of candidates during the recruitment process. This section examines DISC's use throughout the recruitment cycle, from the preparation of short-lists to the interview itself. Cultural Integration is the process of integrating a successful new candidate into an organisation's (or new department's) existing culture. In this section, we discuss the role of profiling in easing a candidate's transition into a new work environment. Regular assessment is becoming more and more widely used in the commercial sector, helping a manager to foresee and preempt problems with staff, and improve motivation and morale. This section covers the practical issues involved in maintaining a regular assessment schedule. Redeployment within an organisation is, in many ways, a similar process to recruitment. This 'Redeployment' section looks at the issues involved in redeploying to fill new roles within an organisation, or in transferring staff members to different positions. The behavioural styles of its members and the ways in which they interact can have a very large role to play in the effectiveness of any team. The use of DISC as part of the team-building process can have a significant positive impact, as we see in this section. From time to time, specific difficulties arise related to one individual, or an internal problem within a small group. This section shows how DISC can be helpful in isolating the causes of these problems, and developing strategies to resolve them. For those seeking a new career direction, or looking for their ideal vocation, DISC can provide some useful guidelines. 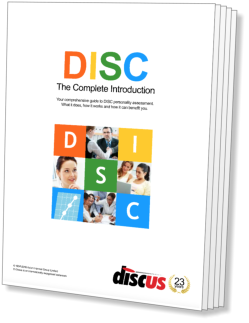 In this section we examine DISC's abilities in the area of career development.